As we enter into Greek [Christian] Orthodox Holy Week following the 40 days of fasting and prayer known as Great Lent, we become mindful of the passion of Christ during this very special and meaningful time of year. Throughout this period of reflection, the discipline of abstaining from meat, fish, and dairy products strengthens the spirit and allows the heart and mind to focus on non-material things: the temptations of power, pride, and possessions. This process allows the faithful to travel the road Christ followed for 40 days and nights before being tempted by Satan. Palm Sunday, symbolized by blessed palm crosses (left), welcomes Christ into Jerusalem and into our hearts. This day we share a meal of vegetables, legumes, beets, fish, and Skordalia (skor-da-liÁH, garlic sauce/dip) before entering a week of strict fasting. into the mouth but rather what comes out of the mouth that is most important.” What good is it to fast and then gossip or be unkind?! Quoting another good friend and Pastoral Minister at our church, George Hazlaris, “Once we have changed our diet, we have to be careful to not be overfilling our stomachs.” Easier said than done…sometimes eating a meat-, fish-, and dairy-free diet can be challenging but for our cookbook we came up with many creative ways to make Lenten (Vegan) dishes by adapting some of Kukla’s traditional ones. Necessity is truly the mother of invention. When faced with 40-plus days of fasting, it takes a creative mind to come up with a number of meal options to maintain good health and nutrition. Brown rice and vegetables are good substitutes for meat in many of our fillings, like those in stuffed tomatoes, peppers, and eggplant. Tired of rice? Try using grains like quinoa, barley, or bulgur…all work very well with the added bonus of superfood nutrients like protein, fiber, calcium, vitamins, minerals, and iron. Our creative zeal actually filled a chapter in our cookbook, providing recipes for vegans as well as those who are fasting. Wheat flour is a grain featured in Lagana, a Greek flat bread traditionally served on Clean Monday (the first day of Lent), that many now use to complement soups and stews throughout Lent and Holy Week. 1. In a large bowl, combine 2 cups bread flour and the wheat flour. 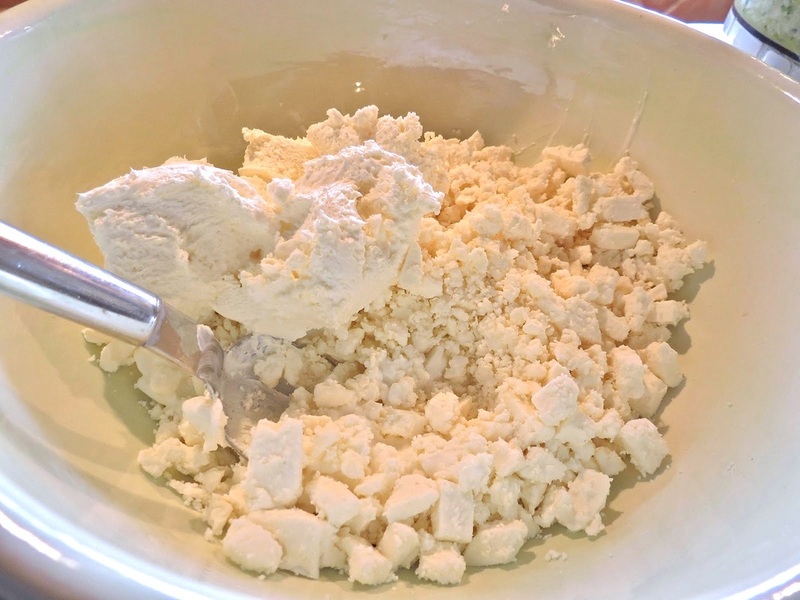 Make a well in the center and add ¼ cup warm water and the yeast, stirring together the yeast and water just until the yeast is dissolved (do not stir in the flour). Let stand 5 minutes. 2. Add the remaining ¾ cup water, the olive oil, and salt to the bowl and mix until combined well. Using hands, form into a dough (if too wet, add additional flour, as needed). On a lightly floured surface, turn out the dough and kneed 10 to 15 minutes, until dough is smooth and elastic. 3. Coat a large bowl with olive oil and transfer the dough to the bowl, turning once to coat top. Cover the bowl with plastic wrap, then a towel, and let stand in a warm place until doubled in size, about 1 hour. 4. Line a baking sheet with parchment paper and lightly brush with olive oil. Kneed the dough for a couple of minutes, until deflated and smooth, then transfer to a lightly floured surface. Gently stretch out the dough into an oval, about 12 by 8 inches, then transfer to the prepared baking sheet. Cover again and let stand in a warm place until doubled in size, about 30 minutes. 5. During the last 10 minutes of rising, arrange rack in center of the oven and heat to 375°F. Press fingertips into the dough to create dimples throughout. Lightly brush the dough with water or olive oil and sprinkle with sesame seeds. 6. Bake 20 to 30 minutes, until golden brown. Transfer to a wire rack and let cool at least 5 minutes before cutting. Serve warm or at room temperature. Holy Thursday evening presents the reading of the 12 gospels that recant the Passion of Christ. On Good Friday evening the candle-bearing faithful exit the church during the Lamentation service and join the procession following the priest and the flower-laden kouvouklion (casket) of Christ—a magnificent sight that draws the attention of everyone within viewing distance. Holy Week comes to a climax Holy Saturday evening just before midnight when the priest and congregation gather outside the church (weather permitting). At midnight the church bells ring in celebration of the resurrection of the Lord and “Xristos Anesti!” (Christ is risen!) is proclaimed by the priest, then a resounding “Alithos Anesti!” (Truly He is risen!) is the enthusiastic response from the congregation. This joyous exchange is ensued by the singing of the hymns of Odes and Praises of the Resurrection before reentering the church. After services, traditional Magiritsa (lamb’s-head soup), Avgolemono (egg-lemon soup), feta cheese, olives, and Tsoureki (Greek Easter bread) with red-dyed eggs (representing the blood of Christ and the Resurrection or rebirth), are served in the church’s hall. Some churches serve a full Pascha [Easter] meal! Following the fasting comes the rejoicing and feasting on Pascha Sunday. In lieu of a liturgy, we have a late morning Agape (Love) church service (during which the Gospel according to John is read in various languages)…that feeds the spirit! At home, the scent of oregano-lemon roasted lamb and potatoes fills the air…and feeds the anxious belly, along with Tzatziki (cucumber-yogurt dip), Spanakopita (spinach pie), and Galaktomboureko (citrus-custard pita with syrup). A suitable celebration and a meal worth the wait! Next week we’ll bring you photos of Holy Week church services and the foods from our upcoming Pascha banquet. Check us out on Pinterest for more photos of our foods! Fasting periods such as Lent can be a challenge as you repeatedly ask yourself the burning questions, “What can I eat today?” or “Peanut butter? AGAIN?? ?” I can’t tell you how many Greeks are now, at this moment, trying to scrape it off the roof of their mouths, and will swear off of nut butters for months after Easter. But it doesn’t have to be that way! Not that there’s anything wrong with peanut butter, but too much of any good thing can be, well, too much. Vegetarians and vegans have figured out how to create diverse meatless menus and so will you with just a few simple tips on how to convert a standard dish into a delicious Lenten-appropriate meal. Fasting means no meat or meat products, as well as avoiding some seafood. Rule of thumb, if it comes from an animal containing blood, it’s out. So the foods that need to be replaced are all meats, dairy (such as milk, cheese, and butter), and fish—shellfish, calamari, and octopus are the exceptions since they contain no blood. So often, people try to fill a hunger pang with bread and pasta, then end up gaining weight and not feeling so good. When you shift your focus to healthy fasting it becomes a life-renewing experience, and isn’t that what Lent should be about? ✚ Greeks love Makaronada, a pasta dish with a thick meat sauce made with tomatoes and ground beef. Instead of putting your recipe away, replace the beef with kidney beans to make a Lenten pasta sauce that’s hearty. Kidney beans have a rich texture and add much-needed protein when fasting, plus they’re seriously flavorful. ✚ When making Gemista, veggies with stuffings (like Lahanodolmadades or Stuffed Tomatoes and Peppers), instead of ground meat, add cooked quinoa…it’s a superfood packed with protein, potassium, and fiber. To give that fiber a boost, use brown rice instead of white (this works really well in vegetarian chili recipes too!). But be forewarned, you may like this meatless version so much that you won’t go back. ✚ These suggestions can also be applied to layered pitas like Moussaka. Instead of meat-sauce layers, layer with beans, quinoa, or take it one step further and add cooked shrimp, thinly sliced scallops or octopus (also precooked). See below for dairy substitutes to use when making béchamel sauce for the Moussaka. ✚ Meat can easily be replaced in most recipes with grains like rice (use brown for extra nutrients and fiber), legumes, orzo (or other pasta), vegetables, or shellfish. Think about what flavors and textures would go best in your recipes, then make the swap! ✚ We use olive oil most of the time, fasting or not. It’s great in baked potatoes, fries up yummy eggs, and it’s delish for dipping bread. It not only tastes good but it’s healthier than butter. ✚ For baking, you’ll want to use a lighter oil like canola or a non-dairy spread like Smart Balance Organic—it’s 100% vegan, non-GMO, with no hydrogenated anything. I mention this brand because, after scouring a number of supermarket dairy aisles, we found very few butter alternatives out there that are actually healthy. ✚ In times of strict fasting, canola oil can be used instead of olive oil. 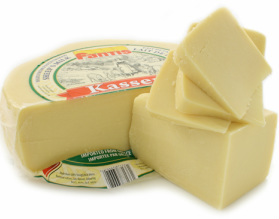 It’s healthier than other vegetable oils and it’s our swap-out choice for butter in Halva. ✚ For taking it straight, the choices are vast—almond milk (my fav), coconut milk, rice milk, soy milk, plain, vanilla, chocolate—so go with what tastes good to you. ✚ For baking, cup-for cup, almond milk is great (did I mention it’s my favorite?). Coconut milk is okay if you want a tropical flavor. Soy milk tends to be a bit tart and bland so use soy if you prefer no added flavor at all. Rice milk, though neutral in flavor, tends to be watery so it might make your batter too loose. ✚ For sauces, custard tarts, or puddings, it gets a bit tricky. Think about the flavor that would go best with what you’re making. If you don’t want an added flavor, use rice milk. Keep in mind that you’ll probably need to go up on your thickener since cow’s milk is more binding than these milks. Start with a little thickener and increase as needed. ✚ For anything else, again, think about the flavor of the dish, then choose your milk. ✚ It’s hard to replace something as gooey and rich as cheese, and the fake stuff tastes, well, fake. If you’re making an omelet or pie, add chopped olives, or sliced mushrooms or diced tofu sautéed in olive oil, to fill it with flavor and texture. ✚ For breakfast, make oatmeal or have cereal…unless you like egg substitutes. ✚ For baking quiche or custard-like dishes, for each egg, substitute ¼ cup pureed soft tofu. 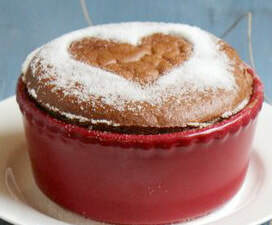 ✚ For desserts like cakes, for each egg, substitute ¼ cup applesauce or ¼ cup mashed banana. For more egg substitution ideas, check out peta.org. For vegan baking tips go to veganbaking.net. 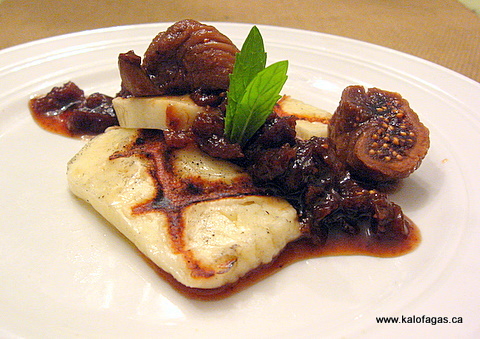 For standard Greek Lenten recipes, take a look at thespruce.com. I hope you enjoyed Lenten Kouzina Made Easy. Lenten and vegetarian recipes, as well as more how-to tips, will be featured in our upcoming cookbook. 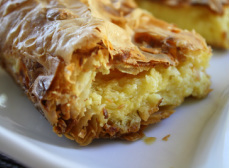 Stay tuned for more uniquely Greek and Karpathian food ideas that you can add to your kouzina routine. Tarama is considered the Greek caviar. This relatively inexpensive carp roe (compared to caviars like Beluga) is aged and cured for over a year and is extremely salty, making the addition of salt in recipes that tarama is used in unnecessary. Although it can be enjoyed in a number of ways, it’s best known as the flavor punch in the classic rock-star meze taramosalata. This recipe can be found in our Meze and Spreads & Dips cookbooks (on Amazon). The color of this spread, which can range from a warm beige to coral to a pinkish coral, comes from the type/brand of tarama used. Let the roe’s pigment guide you in your choice of tarama so the resulting hue will be the one you’d like to have. If a vibrant pink is desired, color will need to be added to the spread as the typical roe isn’t pink enough to give you a cotton-candy color. Before using, the roe is mashed and whisked into an emulsion with olive oil and lemon juice or vinegar, then a starch like whipped potatoes or crumbled day-old bread is beaten in, creating a fluffy mousse-like spread or dip. Taramosalata is appropriate for fasting periods and is a valued food during Lent, though it’s delicious enough to be savored any time. If you think this is just a pre-entrée indulgence, think again! 1. Serve alongside warm pita wedges or raw vegetables as a dip (the standard!). 2. Spread onto French-bread slices or spoon onto cucumber slices and/or crackers (this also works on cheese slices), then add a garnish of capers, fresh herbs (like parsley or thyme) or a strip of citrus peel for color. 3. Greek up your eggs! Think Eggs Benedict but instead of ham and Hollandaise, layer an English muffin with smoked salmon, a poached egg, and a dollop of taramosalata. Finish with a sprig of dill for the perfect morning wakeup. 4. 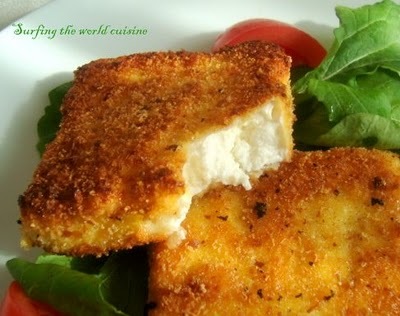 Add to croquette or fritter recipes (plain tarama also works). For a recipe that makes 4 to 6 servings, mix in about 4 ounces of taramosalata or tarama (if using tarama, omit the salt in the recipe). 5. Spread on warm toast instead of butter. 6. Use as a garnish for soup (we love it with bean soups). 7. Use as a topping for grilled veggies and seafood. 8. Make it the main ingredient in sandwiches or use it in place of mayonnaise. 9. Stir a tablespoon into 2 cups of marinara for a creamy tomato sauce that can be tossed with pasta or served as a dressing for fish. 10. Crepe it: Spread a thick layer of taramosalata onto a crepe, top with cooked crabmeat or shrimp and sprinkle with chopped fresh chives, then roll and feast. 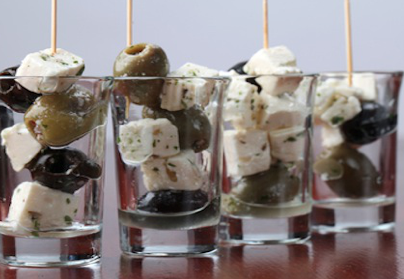 With all of the ways you can experience taramosalata, it’s no wonder this famous versatile meze is a Lenten delight, as well as a go-to for any occasion. Fair warning, it’s hard to stop eating this allure after just one taste! I hope you enjoyed our taramosalata tasting and that these ideas will complement your menus. As we journey through Lent we will continue to bring you more of our customs and foods relating to fasting for spirit and body. 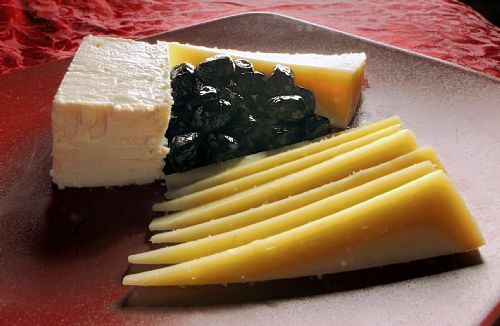 Click here to see more of our blogs on the Greek Foods of Lent. The discipline of fasting during Great Lent and other religious occasions is to bring about cleansing and spiritual awareness in preparation for the Resurrection at Pascha (Easter). 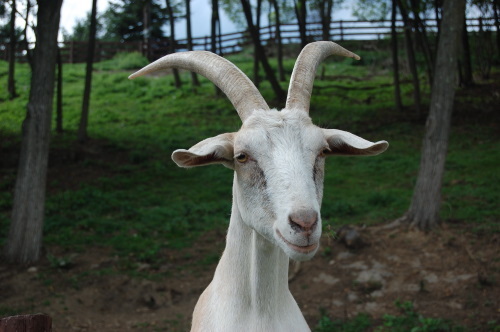 In times of fasting, the Greek Orthodox abstain from foods that come from animals containing blood, which include beef, poultry, eggs, dairy, and most seafood, shellfish being the exception because it contains no blood. During the strictest fasts, olive oil and wine are also abstained from. 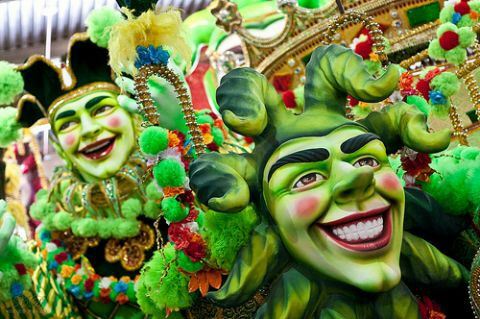 Traditional Lenten foods, as well as our own recipes we developed for fasting, are plentiful and delicious, and some might say that you’re not giving up anything if you’re enjoying your meal. The thing is, when you’re preparing these foods, you’re taking extra care to make suitable substitutions for the foods you can’t eat, which reminds you of why you’re doing it. In turn, you become spiritually aware and the fast is “serving” its purpose. Clean Monday, or Kathara Deftera (Καθαρά Δευτέρα), marks the launch of Great Lent for the Greek Orthodox and the entry of a unique collection of appropriate meals. A cross-section of Lenten foods that have become staples in our diet during this period include the following. Taramosalata (ταραμοσαλάτα): A coral-colored, mousse-like dip containing red carp (fish) roe. For more on this dip and its many uses, check out our blog Taramosalata~Beyond Meze. Revithosalata (ρεβιθοσαλάτα): A chickpea salad with red onion, cucumber, tomato, and fresh herbs. Fakes Soupa (φακές σούπα): A protein-packed lentil soup that gets its Greek twist from vinegar. Lagana (λαγάνα): A flat bread that gets its “dimples” from fingertips pressed into the surface. Horta Vrasta (χόρτα βραστά): A boiled variety of leafy greens. A dressing of lemon juice and olive oil give this side dish flavor and enhance its nutritional value. Dolmadakia Gialanzi (ντολμαδάκια γιαλαντζί): Grape leaves filled with rice and flavored with lemon. 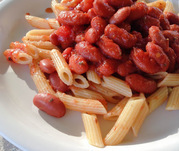 Gigantes Plaki (γίγαντες πλακί): Giant beans in a tomato-based sauce. Htapodi Sharas (χταπόδι-σχάρας): Grilled octopus. Garides sti Shara me Lemoni (γαρίδες στη σχάρα με λεμόνι): Grilled shrimp with lemon. Loukoumades (λουκουμάδες): Light and fluffy puffs drizzled with honey.  Koulourakia made with wine (κουλουράκια με κρασί): Perfect for dunking when you want something subtly sweet. Halva with oil (χαλβά με λάδι): A Lenten favorite, this homemade version of halva is made with semolina or farina and butter, but when fasting, the butter is replaced with canola oil. Once cooled in a form, the halva is unmolded and dusted with ground cinnamon, then cut into slices. Halva/Halvah with tahini (χαλβά με ταχίνι): Very different from the homemade version, this store-bought halva, popular throughout the Mediterranean and Middle East, is made with tahini (sesame paste) and comes in blocks with varietal options that include plain, with nuts (pistachios or almonds) or raisins, marbled with chocolate, and marbled with chocolate that’s coated completely in dark chocolate (my favorite!). The photos in this slideshow demonstrate our Lenten menu on any given day of our 40-day fast. This is the kind of “fast” food that fuels our bodies and souls. I hope you enjoyed our Lenten tasting. Recipes for these foods and more will be featured in our upcoming cookbook! 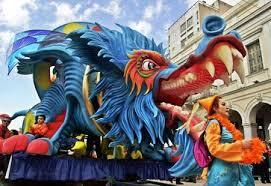 Stay tuned for future blogs on foods and customs relating to this Holy season of fasting and spiritual awakening. Spice Up Your Cooking ~ Greek-Island Style! ​Is your spice rack Greek friendly? There are a number of spices and flavorings that are used specifically for Greek cooking (and healing) and a few that are also used in other cuisines. You might be surprised to find out you already have some of these seasonings, and eager to learn about the ones you never heard of before. 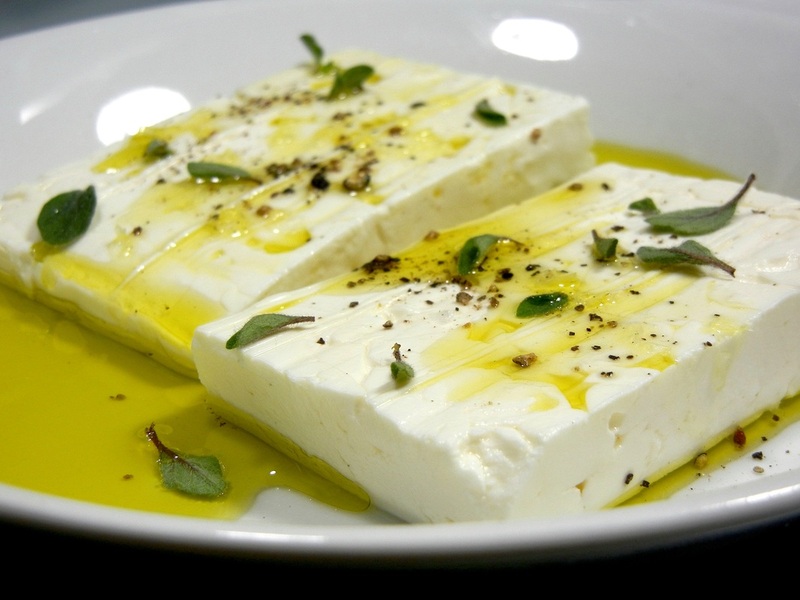 Get ready to stock up on some essential Greek-kouzina spice staples! Following are the spices and herbs no self-respecting Greek would ever be without. If you want to cook like a Greek, you have to stock up like one. Once you have your grocery list ready, check out the stores and websites at the end that carry these items. This seed is what gives ouzo its distinctive smell, and flavors so many foods in Karpathian cooking. Because the seeds are potent, you only need a small amount to give breads, cakes, and pastries a tasty accent. The preparation we use is: Combine 1/2 teaspoon seeds with ¼ cup water and bring to a boil, then simmer 5 minutes or until aromatic. The strained liquid is then added to recipes. These seeds also have a medicinal digestive use for easing gas pains in babies (and adults): Bring 1 teaspoon anise seed and 2/3 cup water to a boil, reduce heat and simmer 5 minutes. Strain and cool to warm. Babies love it because it has a natural sweetness, and it makes them feel better fast. Mahlepi seeds are the tiny (about 1/4 inch) dried pits of wild cherries native to the Eastern Mediterranean and Middle East. Mahlepi is sold as whole seeds and ground, and should be light beige in color (they get dark when they’re old and stale). Whole seeds have a longer shelf life and can be frozen (in a heavy-duty freezer bag) up to two years. When ready to use, the seeds are ground using a mortar and pestle. This beautifully aromatic spice is used to flavor cakes, pastries, and holiday breads. 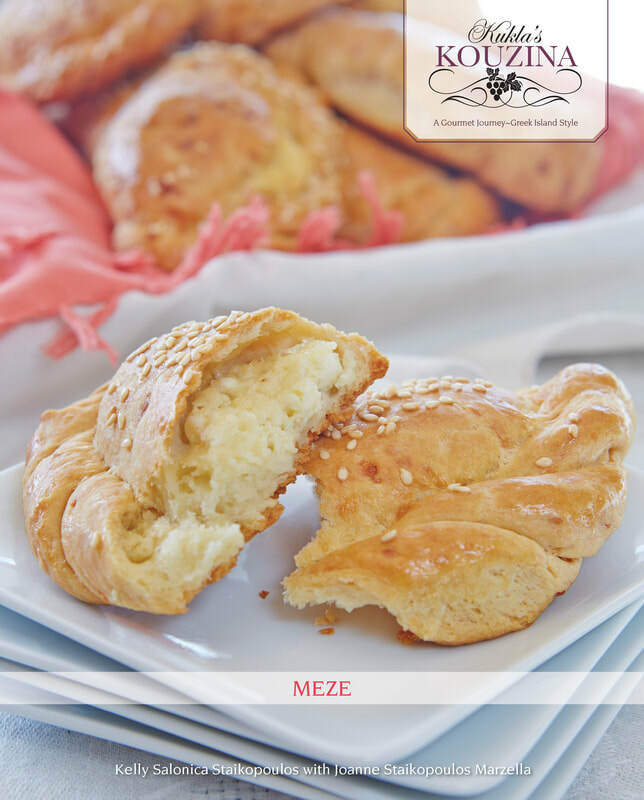 Mahlepi gives tsoureki (Greek Easter bread) its trademark fragrance and fills the kitchen, and house, with its extraordinary sweetness when baking. Mastiha is the rare crystallized resin that seeps from the bark of the mastic tree (Pistacia lentiscus). The tree, indigenous to the island of Chios, also produces a wild pistachio. The resin, which drips in the shape of teardrops, has been the island’s trademark and largest export from ancient times, and is the main source of income for thousands of families on Chios. The value of the mastic trees on Chios has invoked numerous invasions by other civilizations as well as pirates. Masticate, meaning “to chew,” is derived from the word mastiha, which is actually the word Greeks use for chewing gum, and it is believed that this was the very first gum in history. Mastiha is used in a number of different products, including chewing gum, alcoholic beverages, breads, ice cream, syrups, and sweets. Before adding it to recipes, the crystalized resin beads must be ground into a powder, along with a little sugar from the recipe, using a mortar and pestle. The sugar keeps the mastic from sticking to the surface of the mortar and pestle (which it will do if you try to grind it alone) and allows it to be ground into a fine texture. These small black seeds are about the size of sesame seeds and look like they could be black sesame but in fact are not sesame at all. They are picked from the Nigella sativa plant grown in Egypt and India. Nigella seeds are a spice as well as a seed, imparting a smoky, oregano-peppery flavor to recipes. The most common use is sprinkling them on breads, kouloures, and breadsticks, alone or combined with sesame. The essential oils in the seeds have antimicrobial agents and can benefit digestion by eliminating parasites. Amazing food requires high-quality ingredients—fresh vegetables, choice meats, and, yes, sea salt! Sea salt is the only salt used in traditional Greek cooking. Its natural, salt-water flavor is a far cry from the chemical taste of table salt and you will notice the difference! Sea salt also dissolves more easily than table salt when cooking, and is lower in sodium (it’s flaked, so there’s less salt per measure) so it’s a healthier choice as well. Greek sea salt comes in fine, medium, and coarse crystals, is inexpensive, and can be found in Greek/Mediterranean stores, as well as online. In stick form you can tell that cinnamon is the inner bark of a tree, a tropical evergreen tree to be exact. Both stick and ground versions are used in a wide array of dishes. From a subtle flavoring in meat sauces used in moussaka and pastitsio, to a more prominent taste in sweets like baklava and galaktomboureko, this spice is invaluable in the Greek kouzina. Ancient physicians prescribed cinnamon to improve circulatory health and today’s research suggests that it may reduce blood-sugar levels in diabetics (just ½ teaspoon per day). Mayo Clinic: Diabetes treatment: Can cinnamon lower blood sugar? These dried, unopened flower buds of the tropical evergreen clove tree are a valuable spice worldwide. Clove’s aromatic, peppery flavor lends itself to a number of dishes from sauces and meats to desserts like karithopita (nut cake with syrup) and spoon sweets. For centuries, cloves have been chewed to eliminate bad breath and it’s not surprising that some Greeks always have a small bag they carry with them. This dark-brown seed from the nutmeg tree is a lighter brown to tan color on the inside and has a warm, spicy-sweet taste. Though you can use it pre-ground, for the most aromatic and flavorful addition to your foods, we suggest you grate it fresh when you need it (you will notice the difference). You’ll find this spice in béchamel sauce (used in moussaka and pastitsio), potato croquettes, syrups, and cakes. This pea-sized berry of the evergreen pimiento tree seems to embody the flavors of cinnamon, nutmeg, and cloves, hence the name. Sold in dried-berry and ground form, it’s best to grind the berries as needed for the freshest taste. A pinch goes a long way in tomato-based sauces, meats, and Karpathian breads. This aromatic spice is a member of the ginger family and takes the form of seeds in small pods. Cardamom is sold in seed (to grind for recipes) and finely ground forms. We use it ground in sweets and find this spice to be potent enough to last up to a year. Ancient Greeks and Romans scented their perfumes with cardamom and ancient Egyptians chewed on the seeds to clean their teeth. This is the only vanilla used in Greek baking because it’s the most flavorful component of the vanilla bean. It’s white in color, looks a bit like confectioners’ sugar, and is made up of tiny crystal flakes. The flavor is super concentrated compared to vanilla extract so you would use a very small amount—a pinch usually does the trick. It imparts a pure vanilla essence to recipes, without the aftertaste of alcohol (from the extract), making it perfect for custards, cakes, cookies, and breads. It’s a bit pricey but remember that a little goes a very long way, and it will make your Greek desserts taste like heaven, the way they should! We hope you enjoyed our journey down the spice aisle. Stay tuned for upcoming segments on uniquely Greek ingredients! 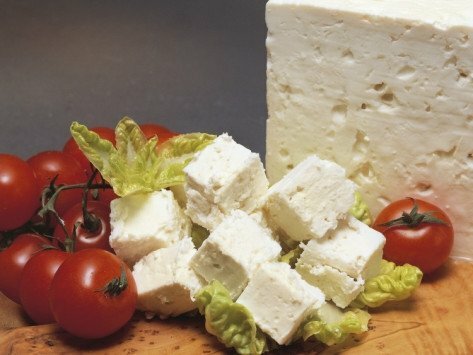 ​When yogurt is called for in Greek cooking, it’s drained (strained) Greek sheep’s-milk yogurt, which is the consistency of cream cheese. 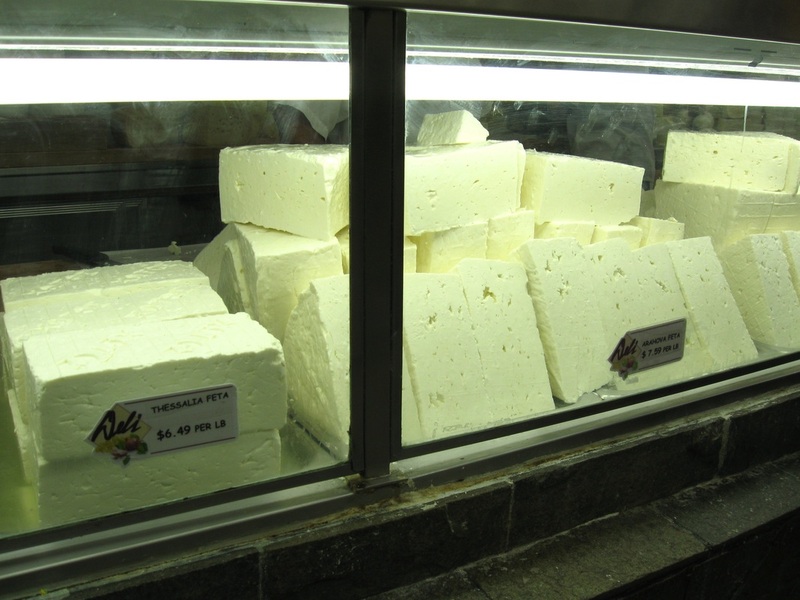 Sheep’s-milk yogurt is sweeter and creamier than cow’s-milk and is available in Greek markets and gourmet shops. 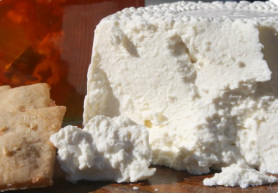 You can also use thick Mediterranean-style sheep’s-milk or cow’s-milk yogurt, available in supermarkets and specialty food stores throughout the United States. Following is our recipe for homemade drained yogurt, a simple and tasty way to DIY. 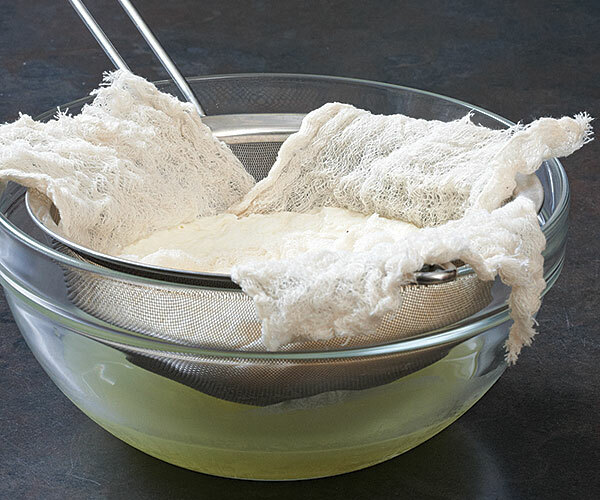 Line a fine mesh sieve with a double thickness of cheesecloth and place it over a large bowl. 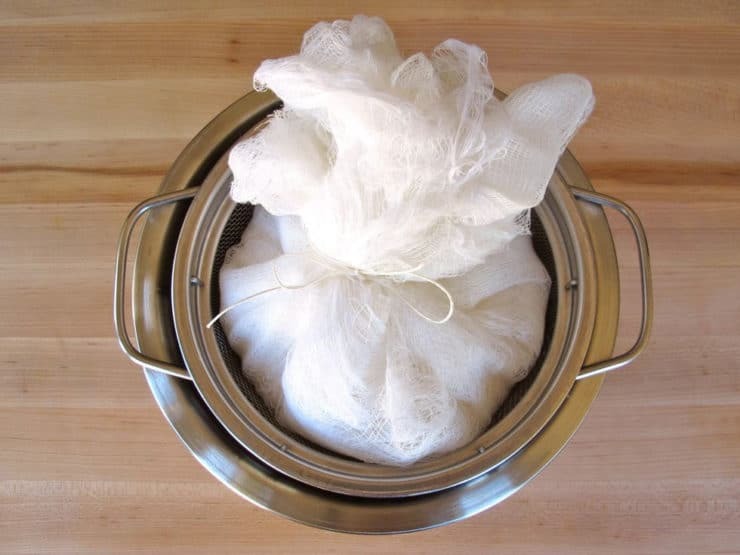 Place the yogurt in the cheesecloth, gather up the sides, and tie them together with kitchen string. Cover the bowl with plastic wrap and let the yogurt drain in the refrigerator until very thick, 2 to 4 hours or overnight (discard the water that collects in the bowl). Makes 8 ounces (1 cup) Drained Yogurt (32 ounces of undrained yogurt makes 16 ounces of Drained Yogurt). Serve with a drizzle of honey, toasted walnuts, and/or fruit, or use in your favorite recipes. 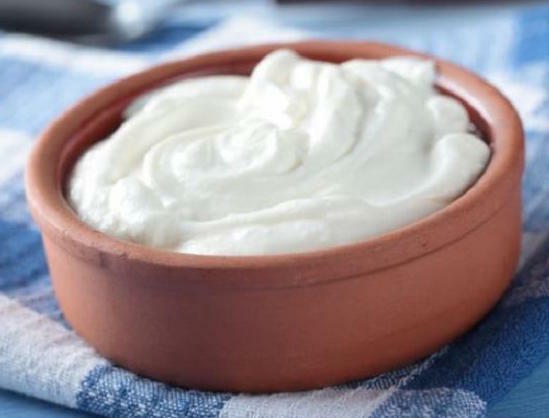 Drained Yogurt is also featured in our Tzatziki recipe, from our Meze and Spreads & Dips cookbooks.